The blacklegged tick that carries the bacteria that can cause Lyme disease is present in the Ottawa area, across Eastern Ontario, and the Outaouais region of Quebec. Ottawa is now considered an at-risk area for Lyme disease. Do a “full body” check on yourself, your children, and pets for ticks. Pay careful attention around your toes, knees, groin, armpits and scalp. Blacklegged ticks are very small and not easy to see which is why you should perform a full body check on yourself, your children and your pets after being outdoors. 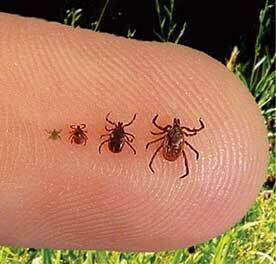 The sooner ticks are removed from the body the less likely they are to spread Lyme disease. If you find a tick on your body, remove it as soon as possible. 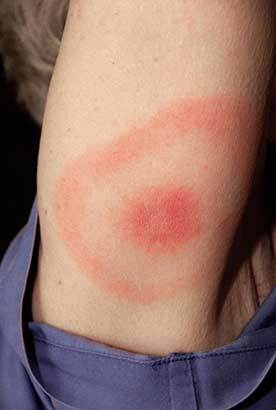 The risk of getting Lyme disease increases with the length of time the tick remains attached to your body. Grasp the tick’s head as close to the skin as possible and pull slowly until the tick is removed. Do not twist or rotate the tick. Do not use a match, lotion or anything else on the tick. If the tick has bitten a human, and you would like to get it tested as part of Ottawa Public Health’s tick monitoring, you can find more testing information below. Symptoms usually begin within three days to one month after being bitten by an infected tick. If your pet spends lots of time outdoors, a tick check should be part of your daily routine. While dogs and cats cannot directly transmit Lyme disease to people, a tick may enter your home on your pet’s back and move on to bite a human. Ottawa Public Health staff regularly conducts tick dragging (link is external) and collects ticks from the public to monitor tick populations and to test for Lyme disease. The number of cases of Lyme disease in humans reported in Ottawa has increased over time. Ticks that have bitten humans in the City of Ottawa can be submitted through Ottawa Public Health for testing. As this is a surveillance and identification program only, results may not be available for a number of months, and the results are not used to make medical treatment decisions. If you have been bitten by a tick outside of the City of Ottawa, please contact the Public Health Unit (link is external) for that area to see if they are testing ticks. Ticks retrieved from animals may be submitted to the Public Health Agency of Canada (link is external). Please note, Ottawa Public Health is not involved in this process.